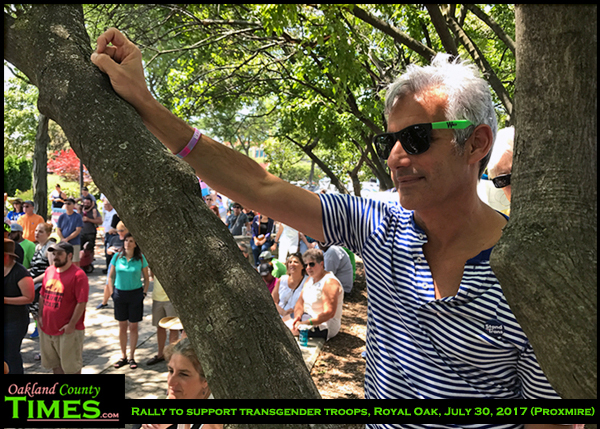 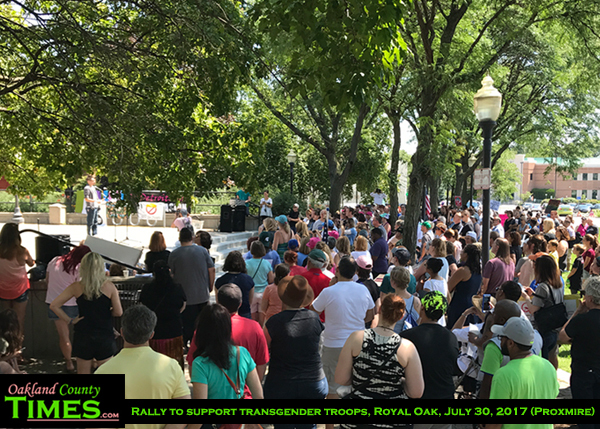 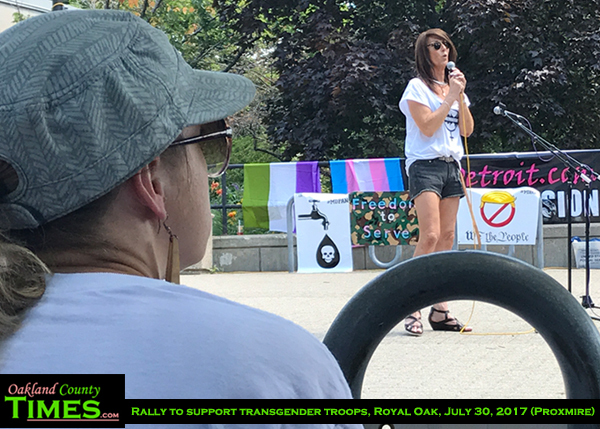 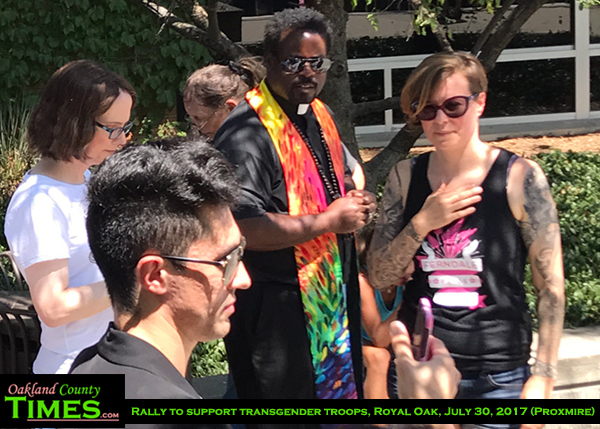 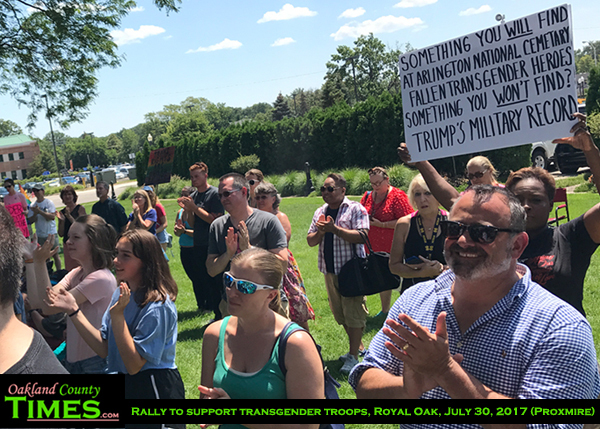 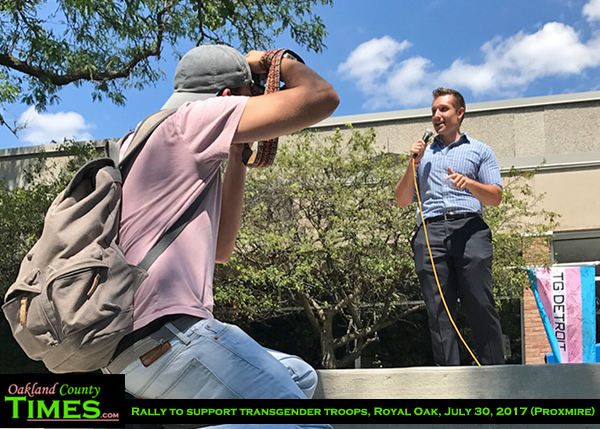 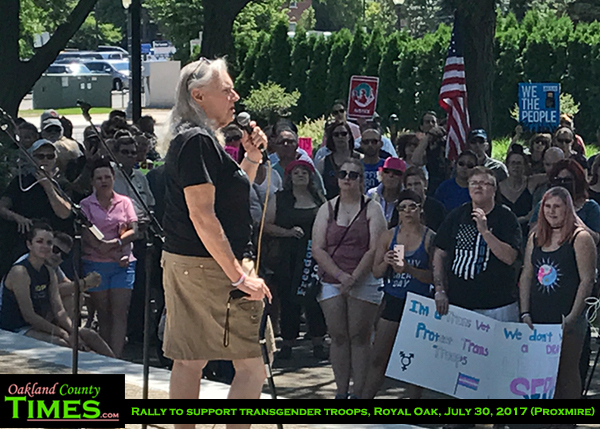 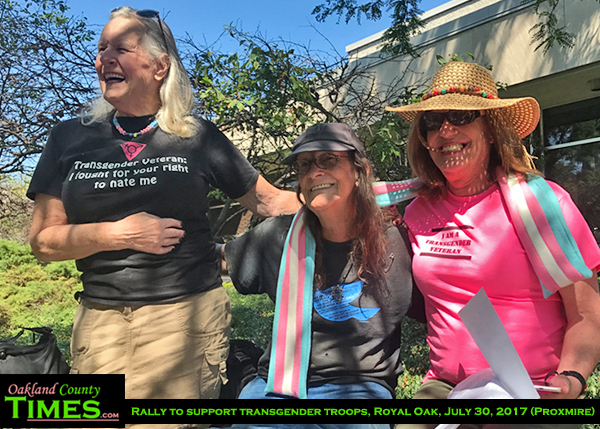 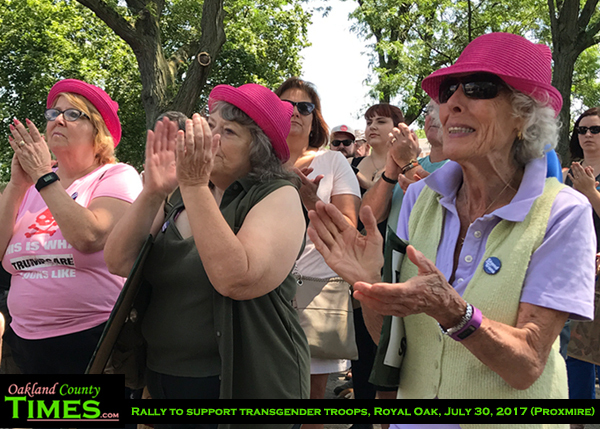 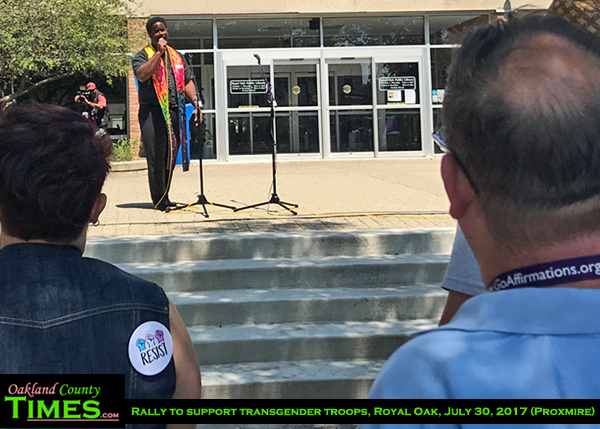 Royal Oak, MI – In spite of the pain that came with President Donald Trump’s Wednesday morning tweet announcing that transgender people would no longer be welcome in the military, there was an atmosphere of hope and love at a rally in Downtown Royal Oak with hundreds of people standing together to support transgender troops. 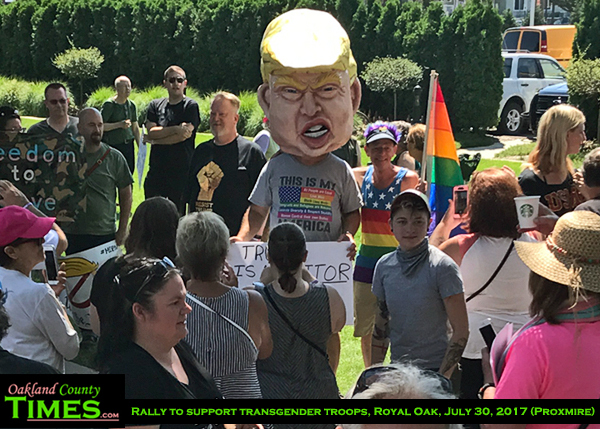 Trump’s Twitter announcement was quickly followed by assurances from top military officials that the policies would not be changing. 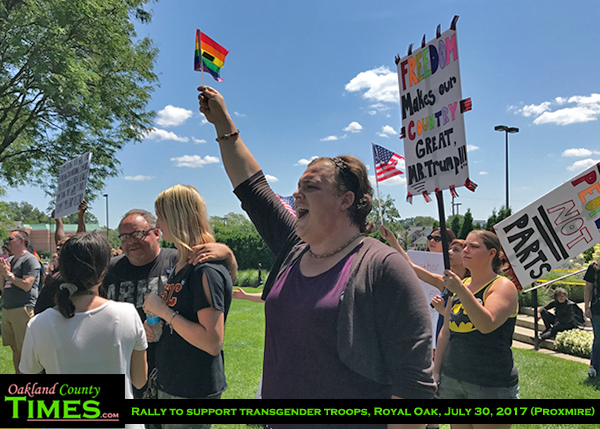 However the jab at the transgender community was done, and the debate sparked nationally over whether transgender people would have equal access to being able to serve. 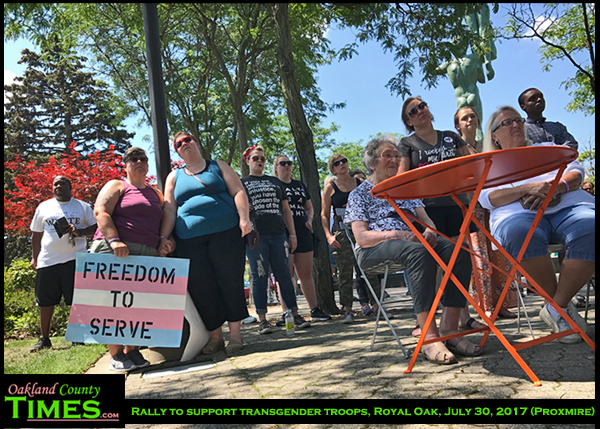 “It’s a little ironic that you’re fighting for freedom and you’re not free,” said Oakland County Clerk Lisa Brown, who was one of about a dozen elected officials from throughout SE Michigan who attended the rally. 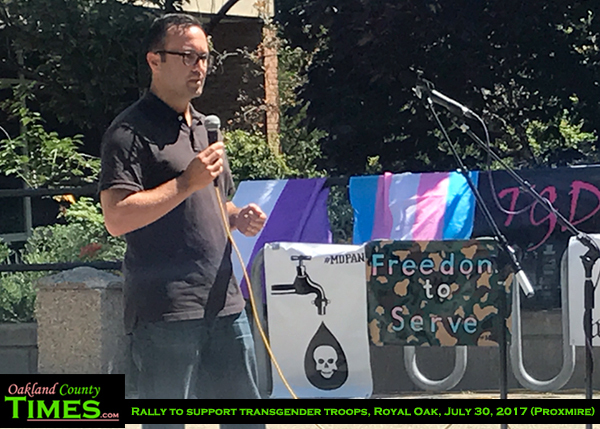 ACLU Attorney Jay Kaplan gave the crowd an update on the facts, stating that Twitter is not an executive order, but that the President could issue one. 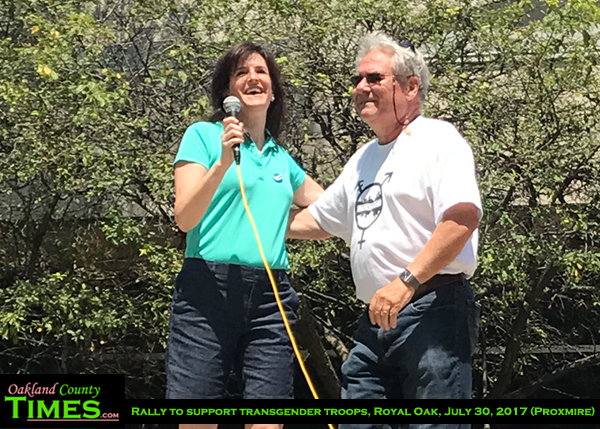 “We have what is called the Equal Protection Clause [of the Constitution],” Kaplan said. 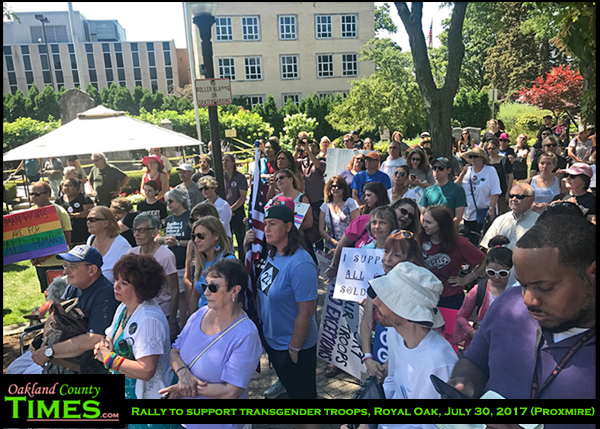 “Any time the government singles out a group of people…that clause comes into play.” The ACLU and other organizations are already prepared for a legal battle if transgender people are barred from service. 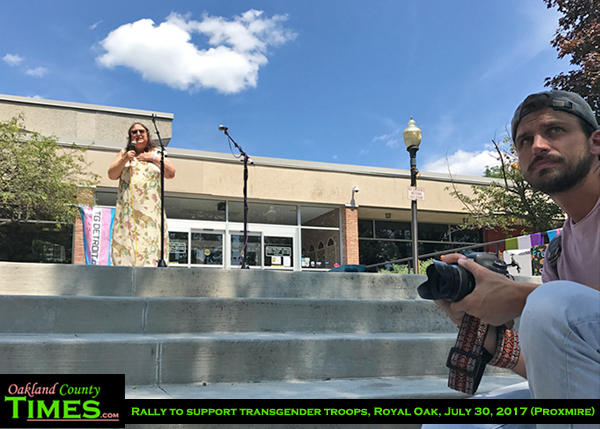 “I decided not to peruse a career in the military due to the fear,” she said. 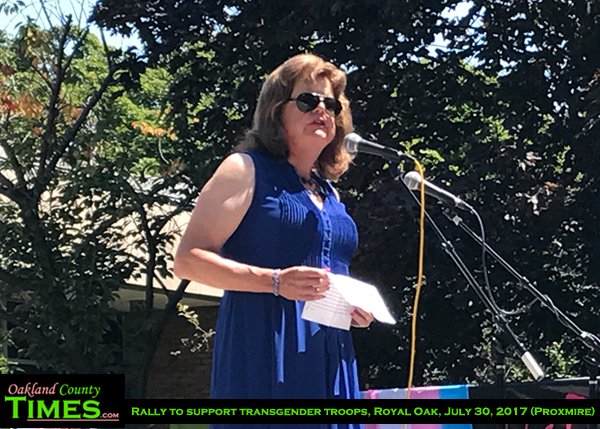 Michelle Davenport served in the Navy for seven years and two months including time in Vietnam. 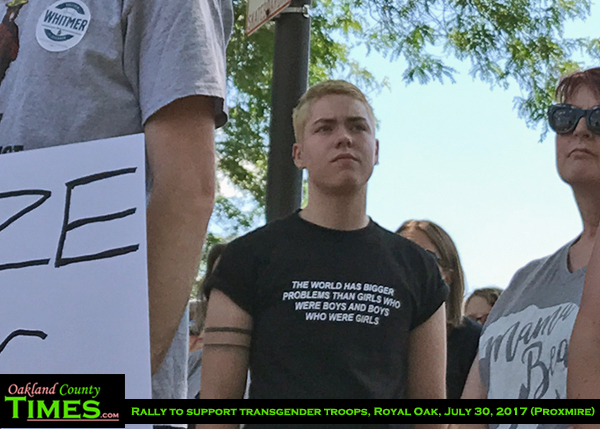 “Now the President of the country I risked my life to defend has spit on me, and I take it personally,” she said. 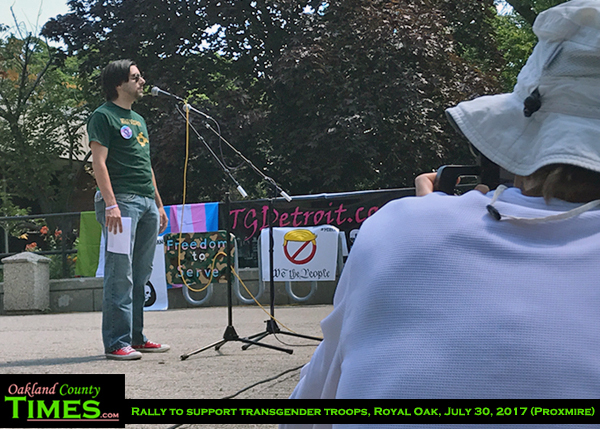 The rally included several LGBT and trans-specific groups including Transgender Michigan, FTM Detroit, Metropolitan Community Church, Christ the Good Shepherd, Royal Oak First United Methodist Church, ACLU, and wa primarily organized by TGDetroit. 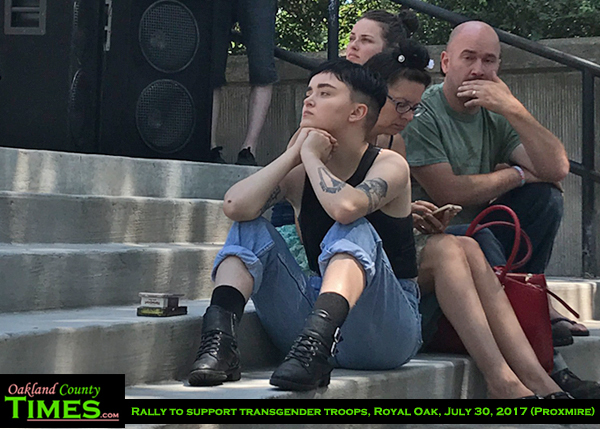 An area of the Farmer’s Market parking lot had been roped off specifically for counter-protestors, though none came. 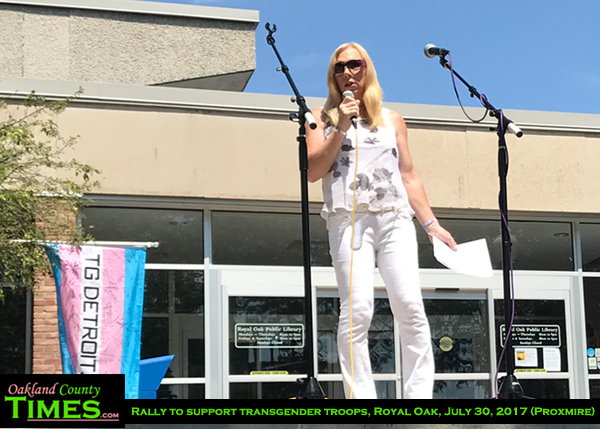 Beyond the hugs and the holding of hands and signs, Ferndale Pride Event Chair Julia Music gave advice to the non-trans people in the crowd about getting to know transgender people and standing up for them to others. 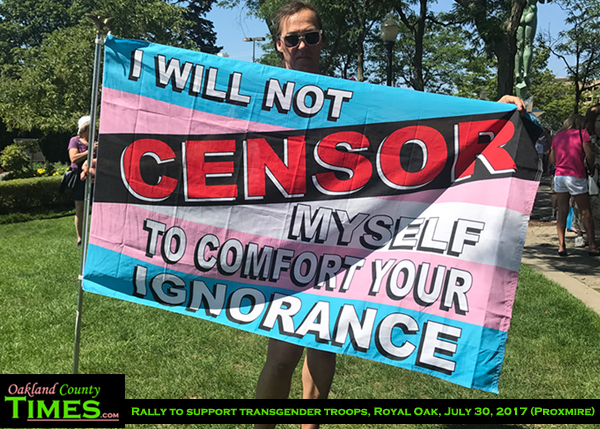 “It’s hard as cis people to know what to say, but keep saying it anyway. 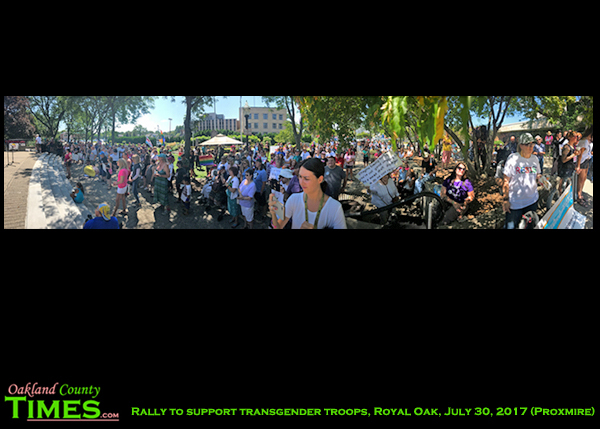 Keep saying ‘no, you’re wrong, here is the information,” she said. 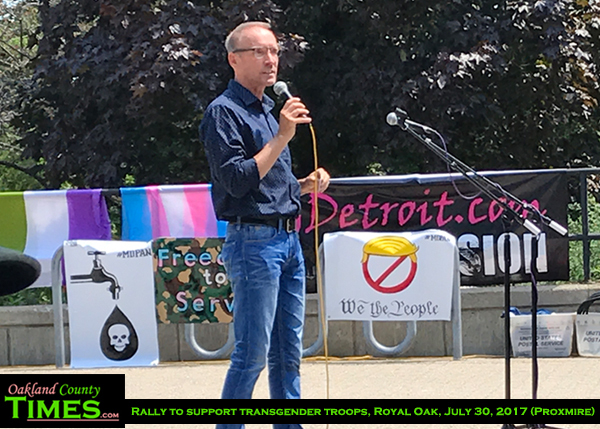 NOTE: This article has been updated to correct the spelling of Gerri Conley and to clarify the distinction between Transgender Detroit and TGDetroit.